Day road trip! 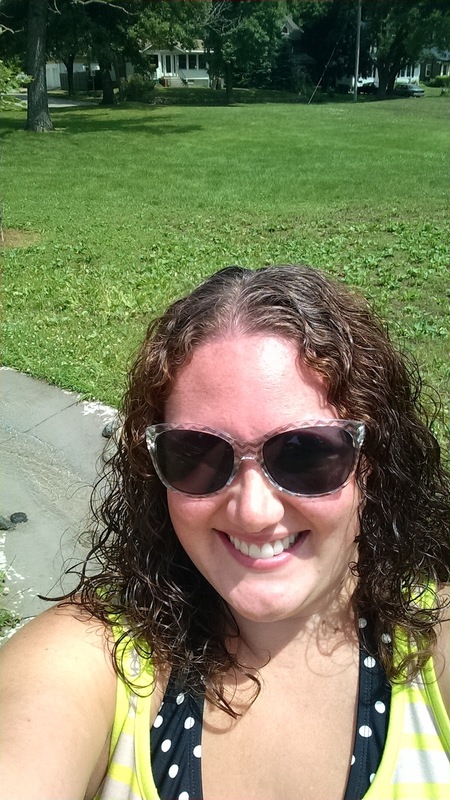 We're headed to Dyersville, IA to see the Field of Dreams and then hiking in Maquoketa Caves State Park. These two things have been on my To Do List for a couple of years now and I've finally talked the Hubs and minis into going. Lounging. After a day of road tripping (and many hours in the car) I know we'll all need a day to spend lounging in our pj's. Walk along the Principal River Walk. It's been a while since we've walked along the river, but I love the walk and scenery. 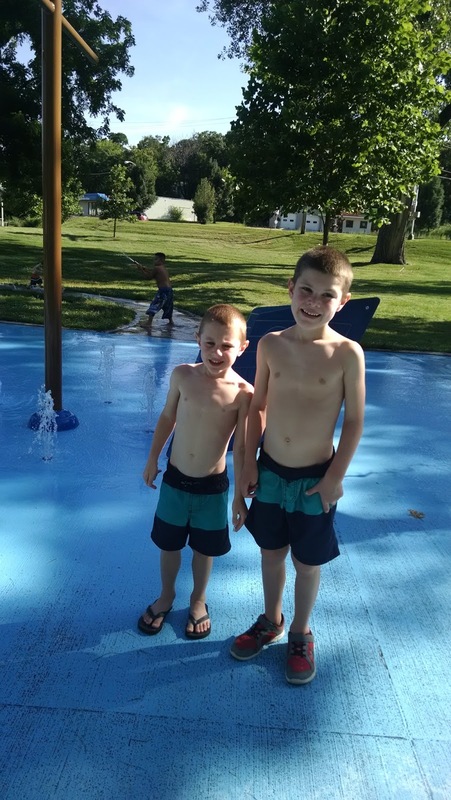 Head to one of the city's pools--they only a have a few weeks left to be open. Check out our Tour of Wading Pools for some ideas of where to go! National Balloon Classic has one more day left. Head down to Indianola to the balloon field and check out the National Balloon Museum not too far away. Lake Ahquabi. 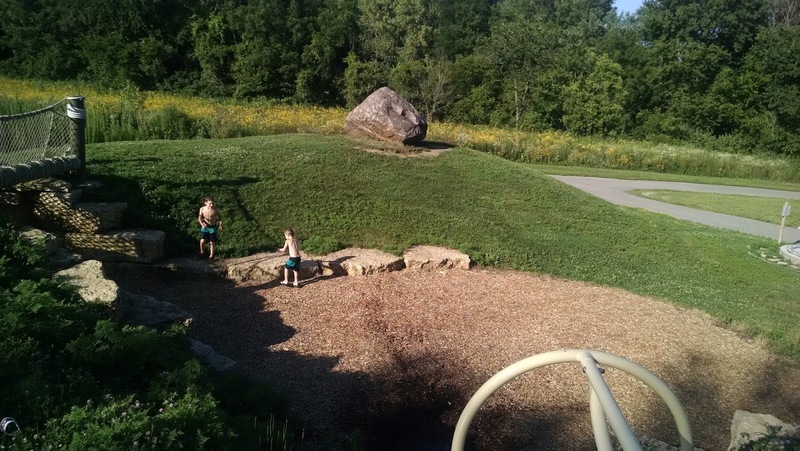 After the Balloon Classic, head down to this other Indianola gem for hiking, canoeing, or swimming. Read about our visit there last summer. 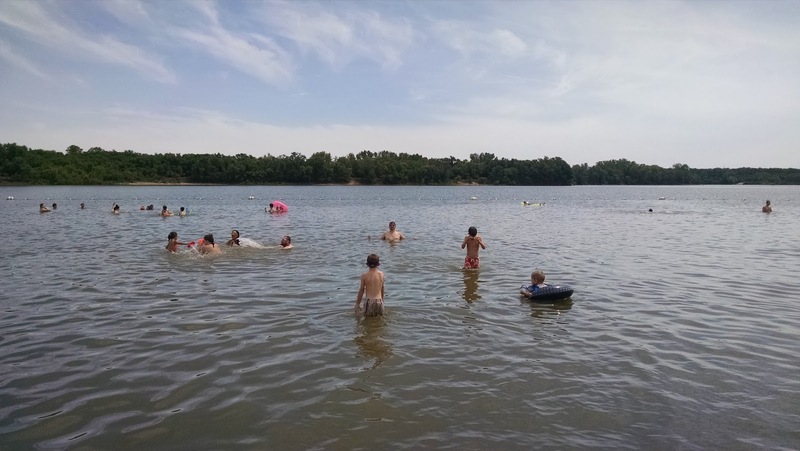 * I find it a bit ironic that this weekend last year I had been wanting to go to Dyersville and wound up at Lake Ahquabi instead. All of the credit for our Spy Day theme goes to my cousin Silvia, who has been helping out at the daycare this summer. Since it's very evident how much the kids love these theme days, we sat around one Friday afternoon during nap times and brainstormed new ideas with the big kids. Spy Day took some planning and a solid couple of hours to set everything up, but the kids had A TON of fun with our spy activities! 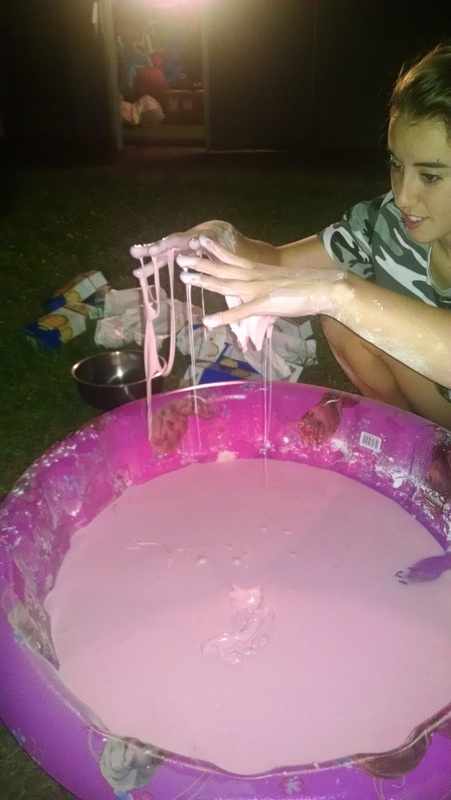 Silvia and I spent a couple of hours the night before setting up the "Laser" Maze and getting the goop pool ready in the backyard. My favorite part of this picture is all of the empty boxes of corn starch in the background. We used A LOT of corn starch for the goop pool! 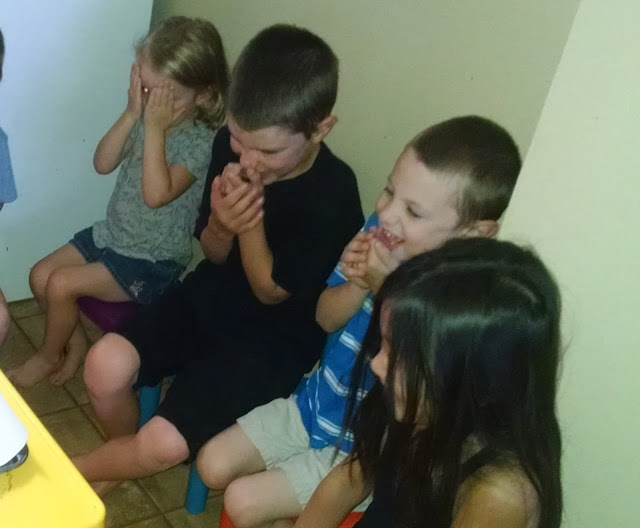 The kids had "spy glass" donuts for breakfast! 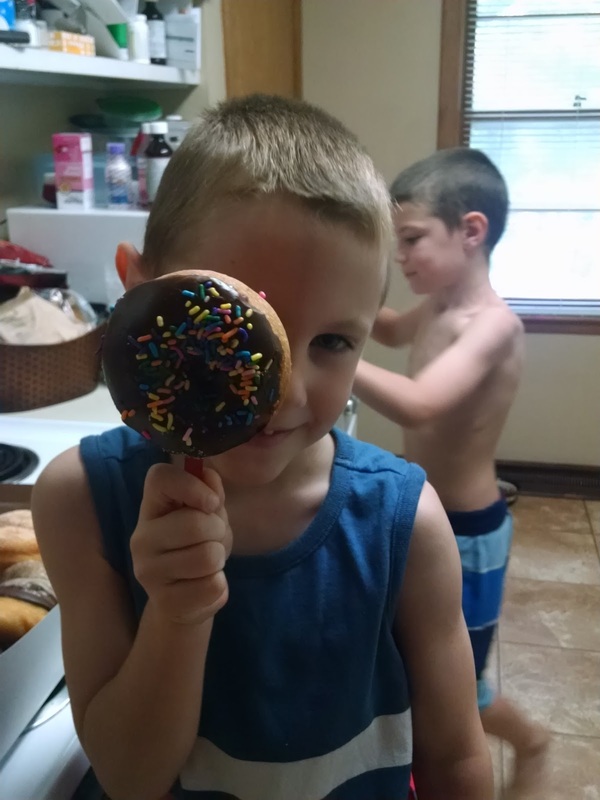 We took popsicle sticks (the ones we use for crafts) and stuck it through the donut. The kids pretended to spy on each other during breakfast. I did have to go over NOT holding the donut too close to their eyes so we didn't have any sugar/frosting in the eye issues. Again, the things I never thought I'd have to say. The laser maze! 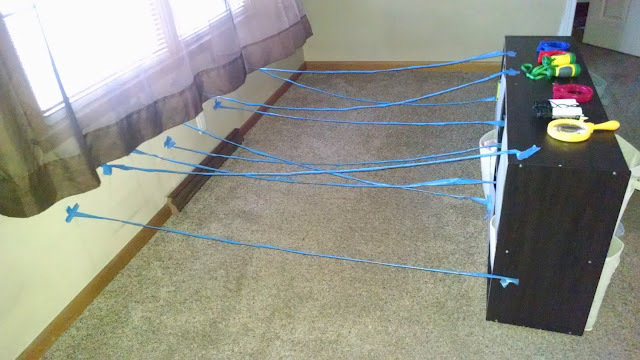 I've seen this idea on Pinterest using string, but I had a feeling that the kids would easily tear down the string. Instead we used painters tape against the wall and a shelf. 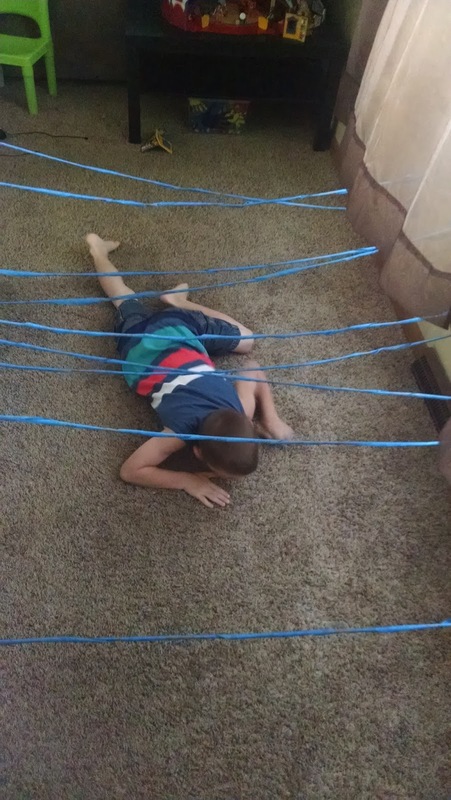 It worked perfectly because the kids instantly felt the tape against their leg and stopped. 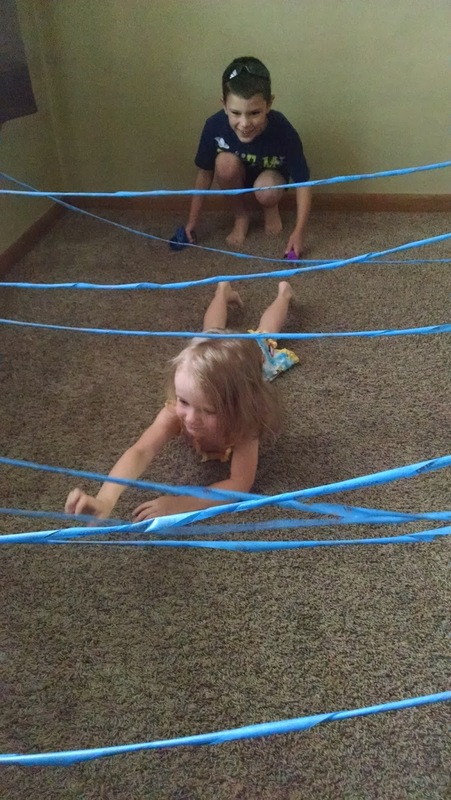 I was actually surprised the tape held up for several rounds of crawling before the kids pulled it down.....and then played with the large ball of tape. Our Spy Obstacle Course in the backyard! 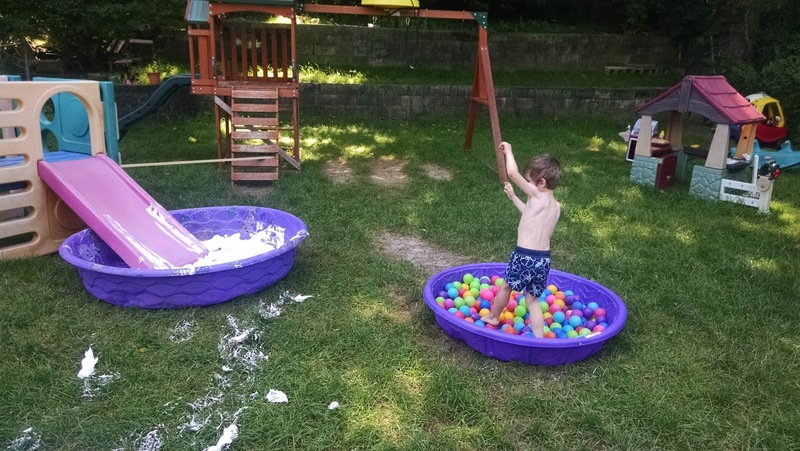 They had to run through the goop pool (I called it the Goop Pool Sink because their feet instantly sank in the goop and then they had to pull them out), run through the ball pit (which was hard to do after their feet were covered with goop), jump over or crawl under the pole, down the shaving cream slide where their mission was to find a "magical" coin, and then into the bubble pool to wash their coin (and themselves) off. 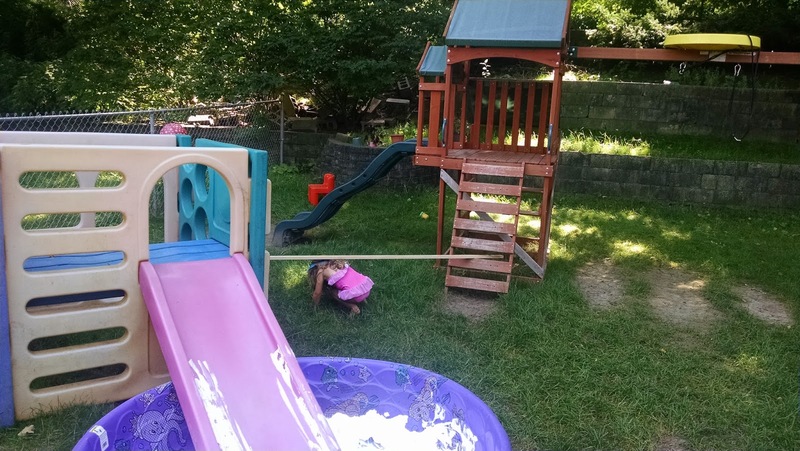 Once every child had a turn on the obstacle course, we let them play in the obstacle course however they wanted. 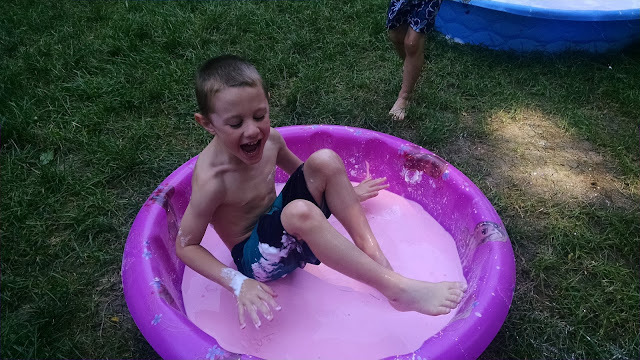 The goop pool was one of their favorites and they didn't just run through it! They sat, rolled, put it on each other's heads, and one child even tasted it (it's corn starch, water, and food coloring, so no harm done). The other hit was the shaving cream pool (we did this pool during our Field Day 2015 and the kids LOVED it). 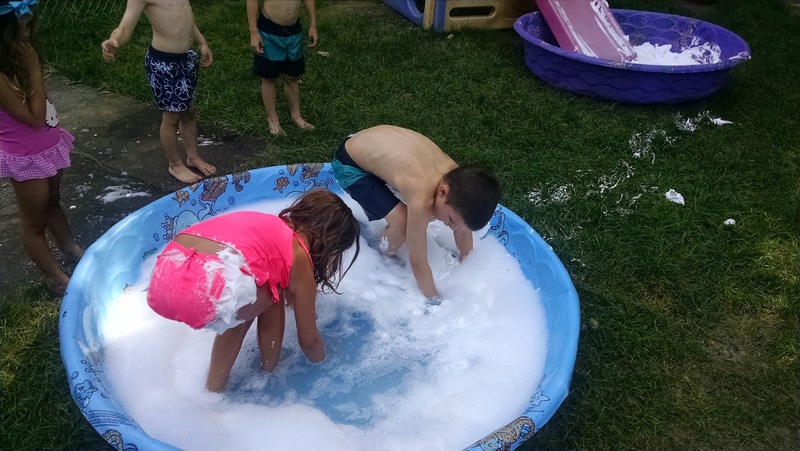 The kids spent a good amount of time in the shaving cream pool finding the rest of the "magical" coins and cleaning them in the water. 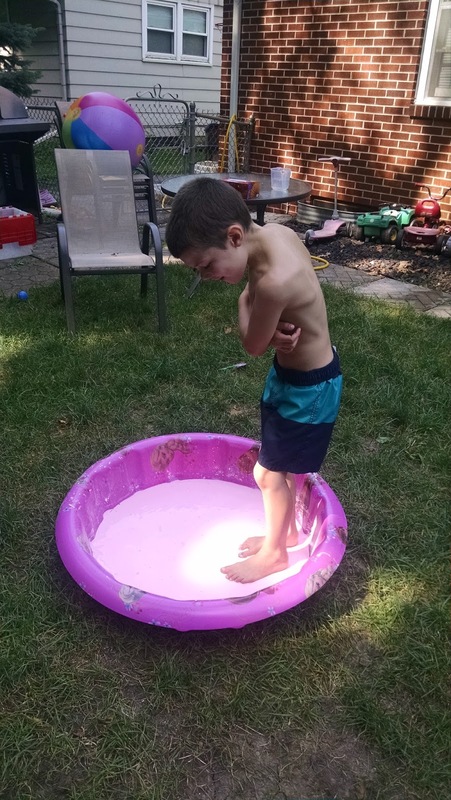 By the end of the morning and two hours of playing time, the bubble pool was pink and filled with goop and shaving cream. 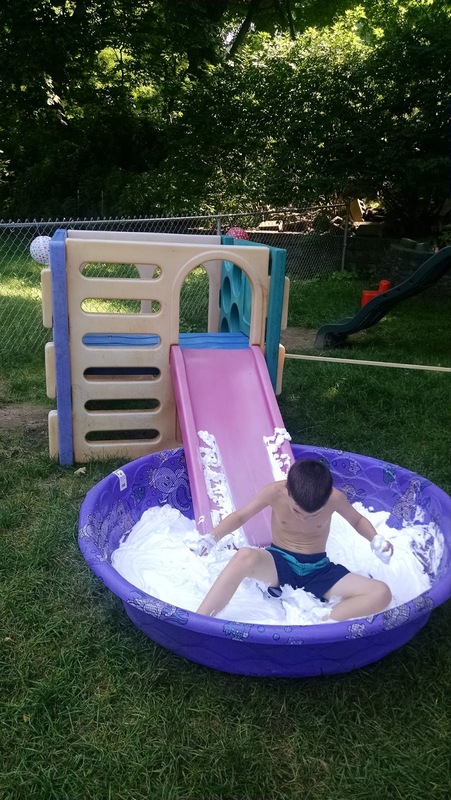 All of the kids rinsed off in the shower after these messy activities! 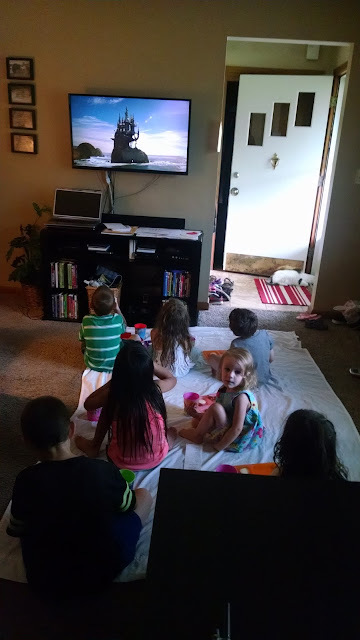 We ordered "Spy Snacks" (actually called Scooby Snacks from Northern Lights PIzza), had a picnic on the living room floor, and watched the Spy Kids movies on Netflix. In the afternoon, the kids went through a large garbage bag full of recyclable materials to make their own spy weapon! 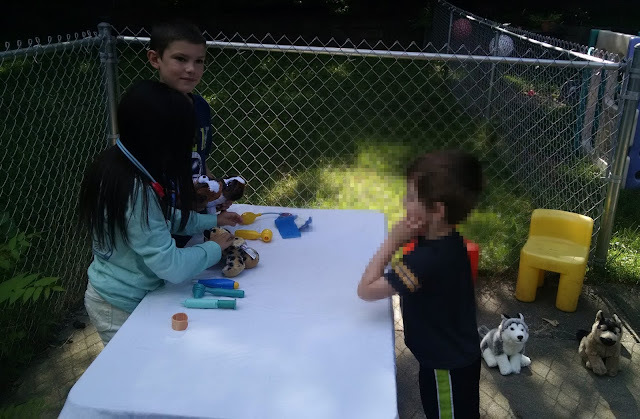 Several spy guns and spy glasses were made, but a few of the kids got really creative and made things such as a "Peanut Butter Bomb" and an "Egg Carton Explosion." 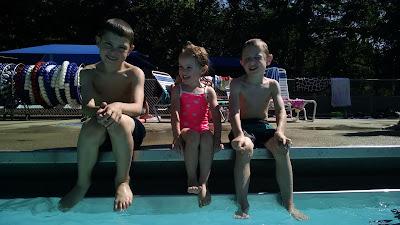 The kids younger than three didn't really enjoy this day, but we still had things for them to do. The three and older crowd definitely loved everything about Spy Day. 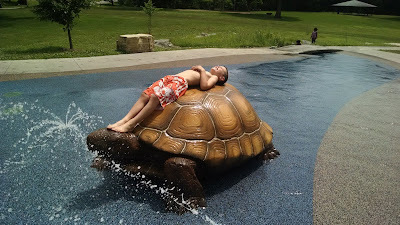 We will definitely be adding this to our must do again list for next summer! The new "hot" toy: Playmobil Circus. 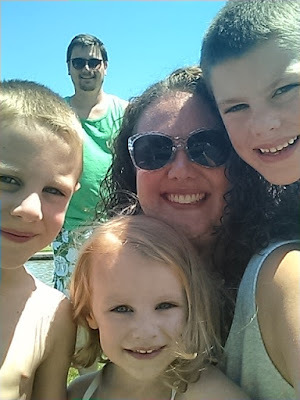 We had such a fun week! We had two hit theme days, dissected frogs and hissing cockroaches, grew bacteria on agar plates, and showed some great creative thinking while playing with figurines. The kids loved watching bacteria grow on their agar plates. Each child got to do one and each child did something different: a hand, elbow, foot, ear, chin, belly, knee. We also tried my teeth, the shower curtain and toilet seat. 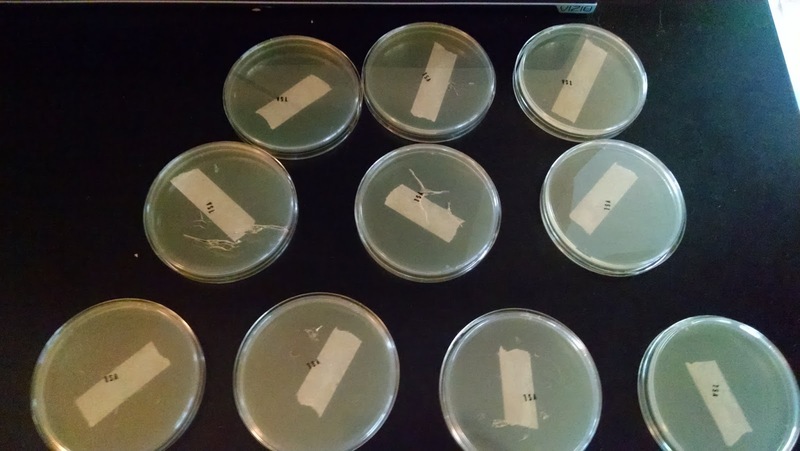 After seeing some of the plates at the end of the week, I think it's safe to say that we'll be spending next week going over how to properly wash hands! The kids had a great time during Pet Rescue Center Day. Read more about this theme day here. The group of kids I have right now are very inquisitive. All summer we've been talking about life cycles: we watched our larva morph into painted lady butterflies, flowers, lady bugs, and how a tadpole becomes a frog. 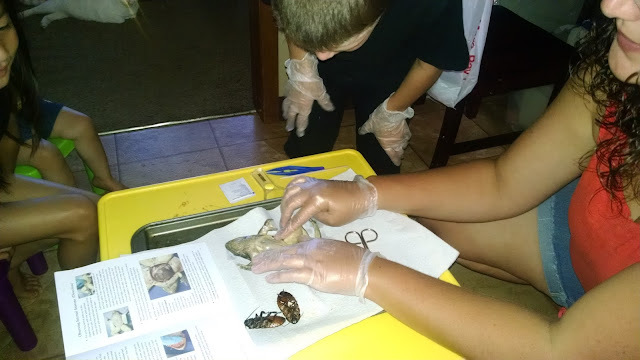 To give them a closer look at things, we dissected a frog and hissing cockroaches. The kids asked A LOT of questions and were very interested to see how "the insides" were different from us thanks to our Human Body book. 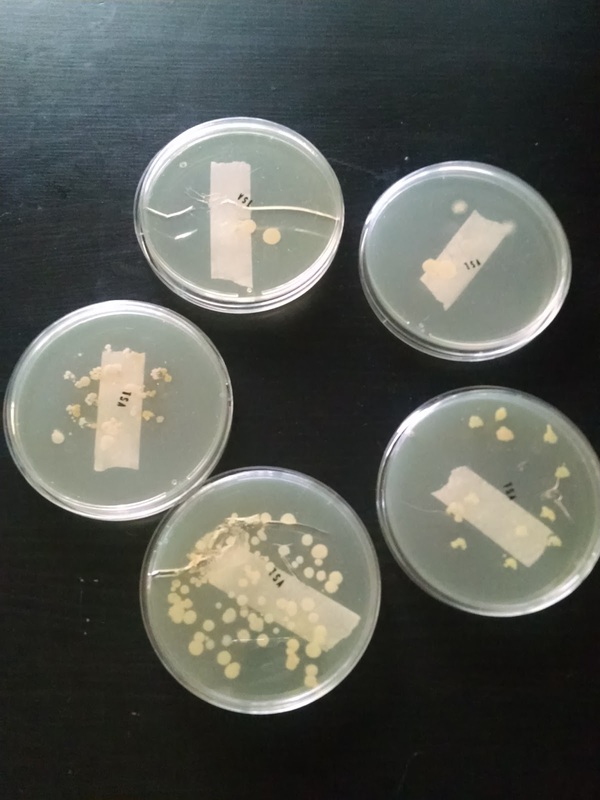 I did the dissecting of the frog, but I let a few of the older kids dissect the cockroaches. The only child slightly traumatized by the experience was Elizabeth, so gasped and kept her eyes covered nearly the entire dissection. 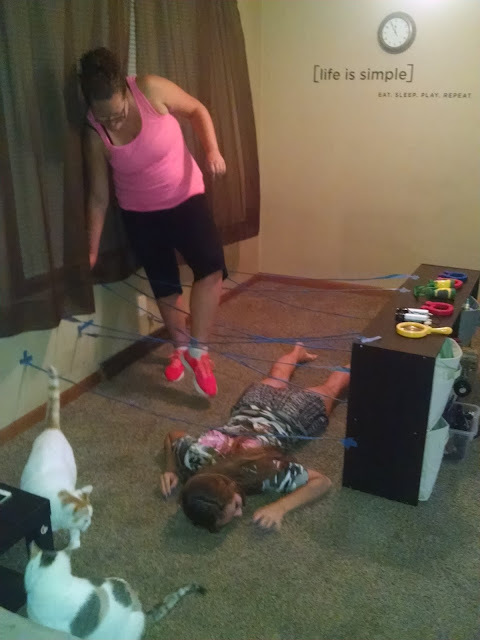 Thursday night was a late night as my cousin Silvia and I set up activities for Spy Day. 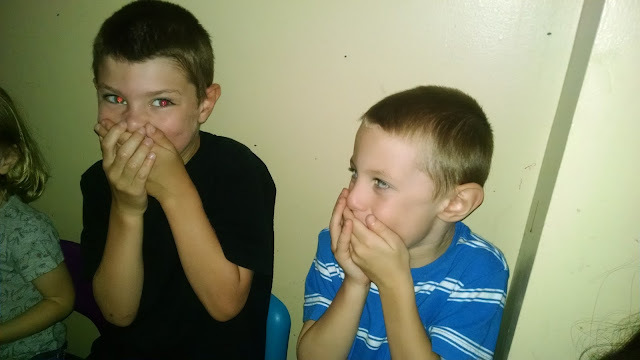 The set up time was so worth it because the kids LOVED Spy Day! More to come on that next week. I'm having a very hard time accepting that the end of summer is coming. The kids have been an absolute joy this summer and have truly just enjoyed being with each other. 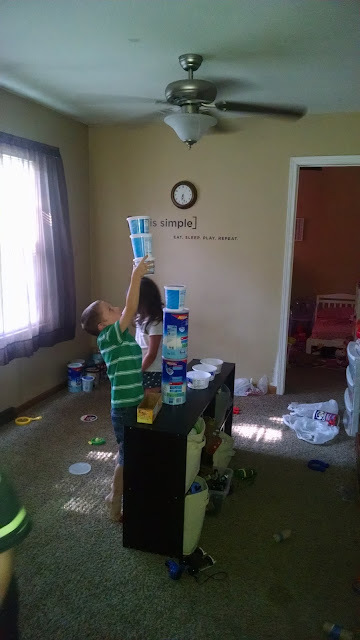 In the past I've felt like I've had to come up with all sorts of games and activities to keep them busy. This year they've really come up with most of the activities and games on their own and have gotten really creative in the play. I feel like we haven't gotten to nearly half of the activities I had planned, but we've still had a lot of fun and learning. On the agenda for the upcoming week: I did a toy rotation and brought up toys the kids haven't played with in months, so I'm quite certain there will be quite a bit of time playing with the "new" toys. I'd also like to get a painting day in this week and maybe another theme day as well! Archery at Archery Field & Sports in Altoona. The boys have been bugging me to give this a try, so I figured I might as well give it a shot while we're there. Adventure Bay. 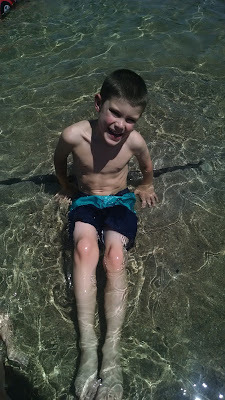 We plan to cool off from archery in the lazy river....and maybe a drink from the swim up bar. 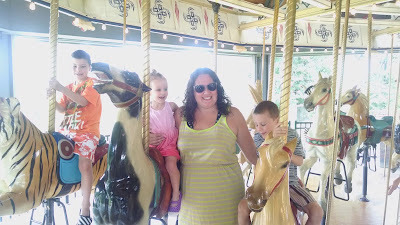 Warren Country Fair. 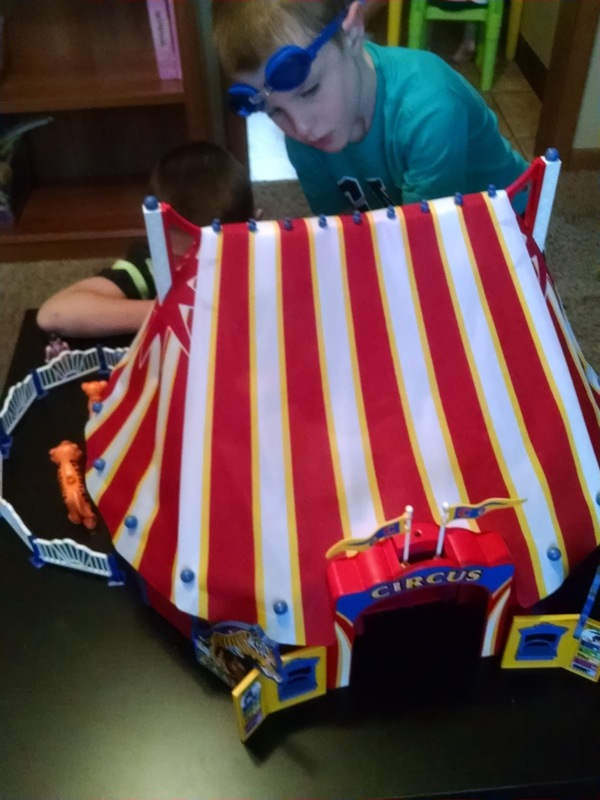 Prep the kids for the "big fair" coming up in just a few weeks! National Balloon Classic in Indianola. We went last year and it was amazing! Need to cool off from the heat? 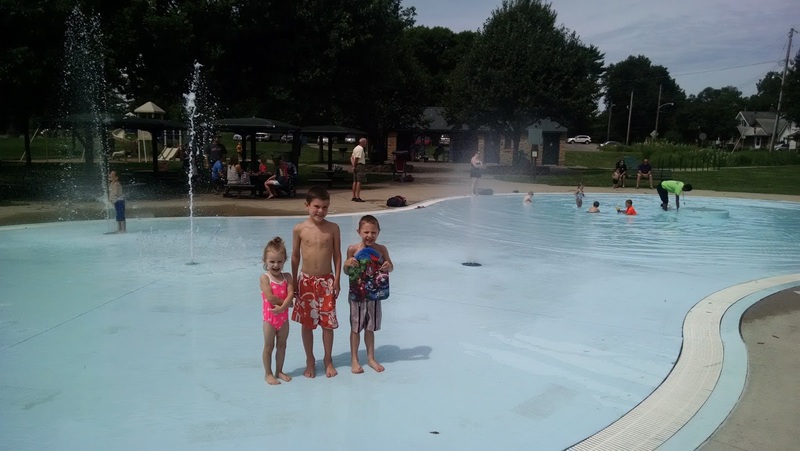 Try our Tour Of Wading Pools! What are your weekend plans? 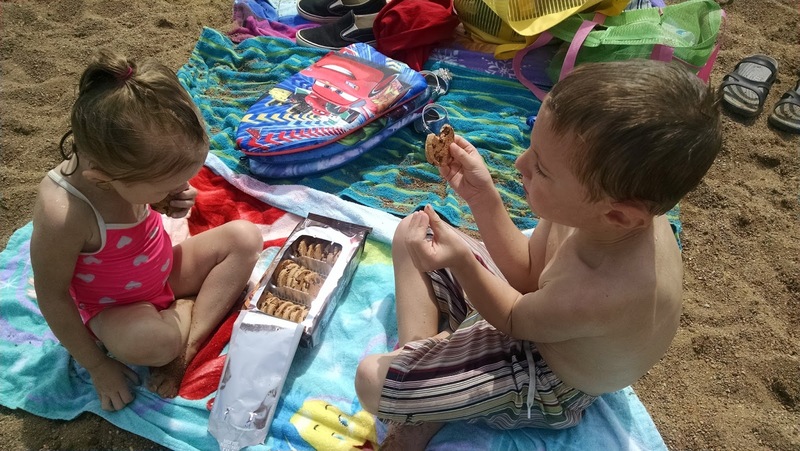 We'd love to hear them to get ideas for future weekends! 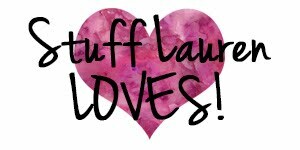 When I come up with new theme days ideas, I always keep in mind the kid's interests, what they're currently playing with, and how they're playing. Last month they spent an entire day playing puppies and kitties. Unfortunately that fun had to end when they decided it was okay to try to bite and scratch each other because "that's what dogs/cats do!" Um, no. So when that game got banned, I watched the kids grab all of the stuffed animals and play with them. Hence the idea for a pet shop themed day. 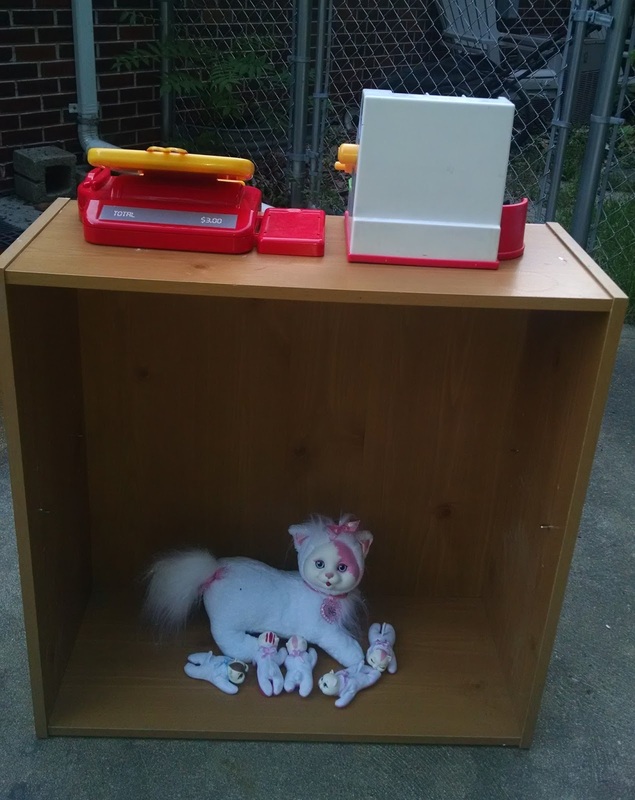 But since I'm not a fan of pet shops, I declared it a Pet Rescue Center Day (because who doesn't like to adopt pets in need??). 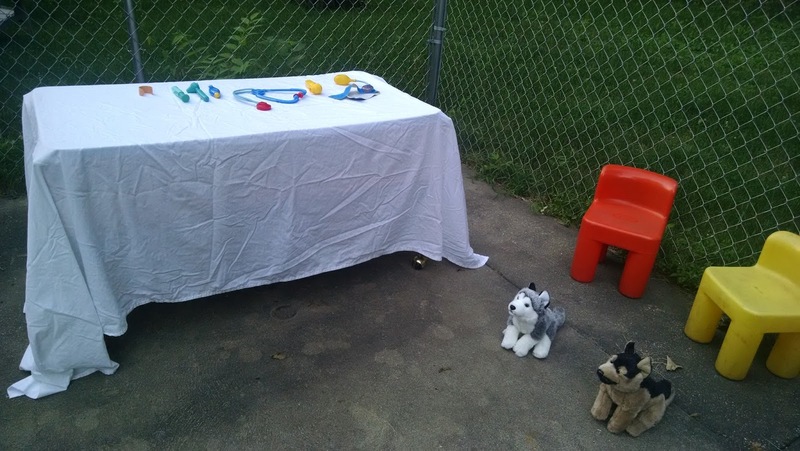 Set up for this was fairly simple other than carrying pieces of furniture to the patio. 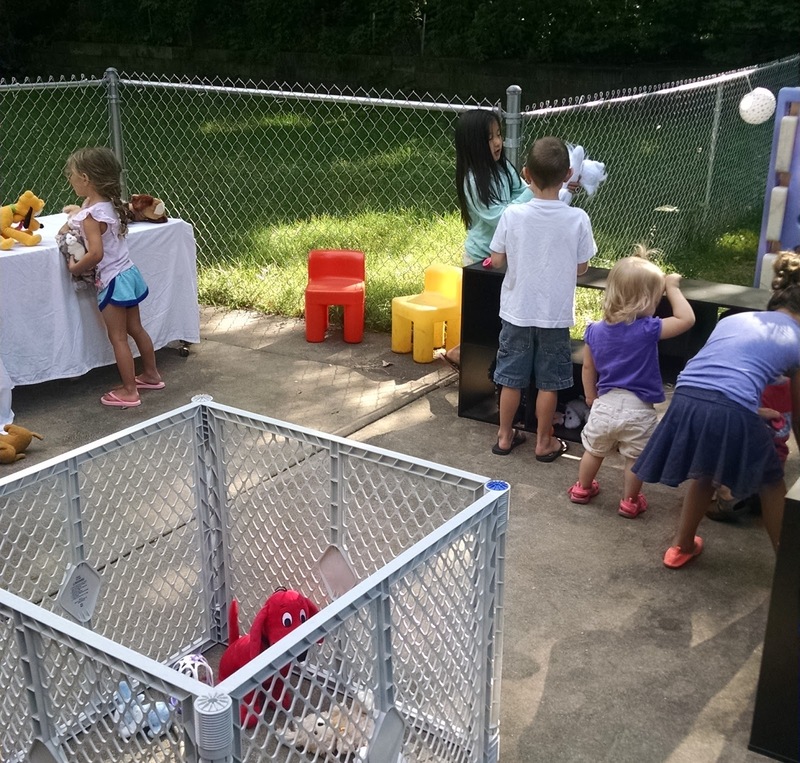 I used ClosetMaid stackable cubes as the animal cages, baby gates for a pen, a spare book shelf for the cash registers, and our sensory table doubled as a veterinarian clinic. 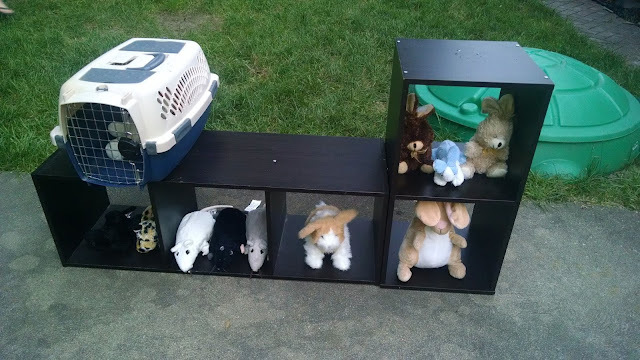 We had stuffed bunnies, mice, dogs, cats, and DijiBird. I found a couple of carriers we use for the cats on vet day. 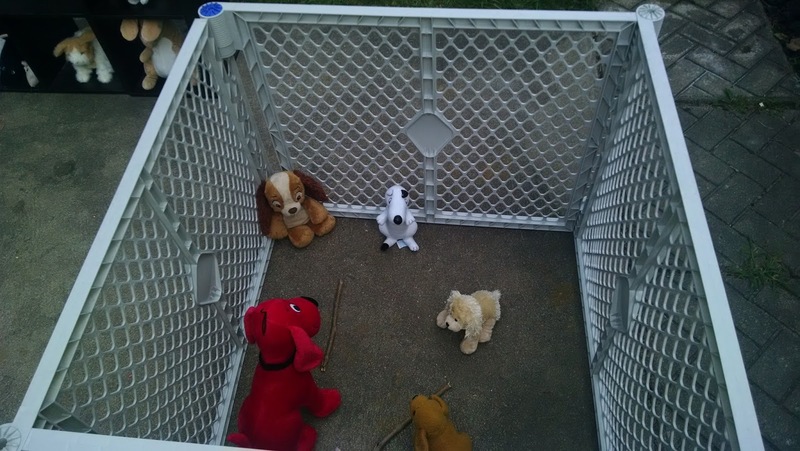 The kids mostly used them to see just how many puppies they could stuff in there at once. The kitty mom with her baby kitties that can also be stuffed into her tummy. 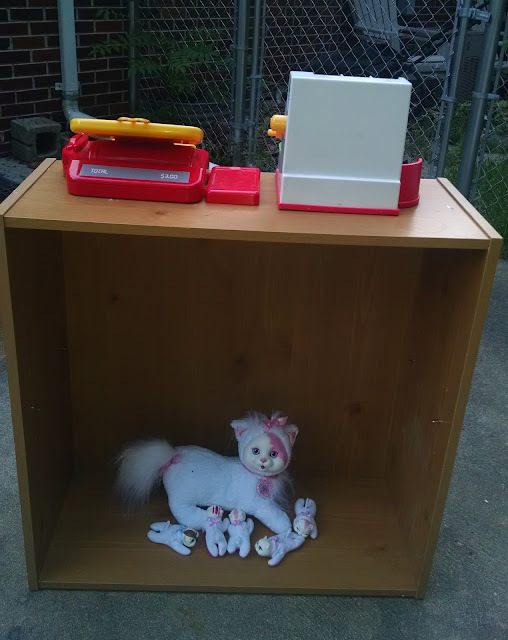 This toy sparked a lot of questions as to how kitties were born. There were some interesting theories amongst the kids. 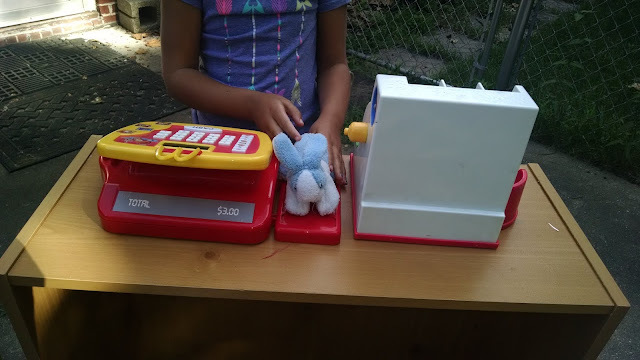 The bunny was weighed and declared to be "$520, but I'll just take a few pennies instead." 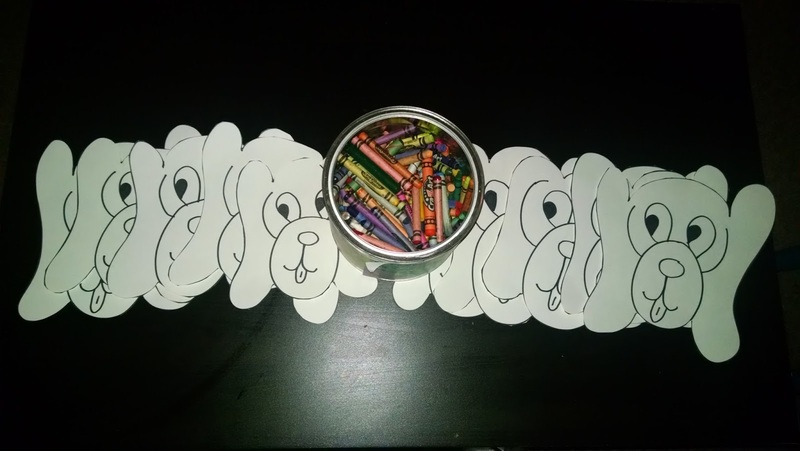 Dog cut outs. 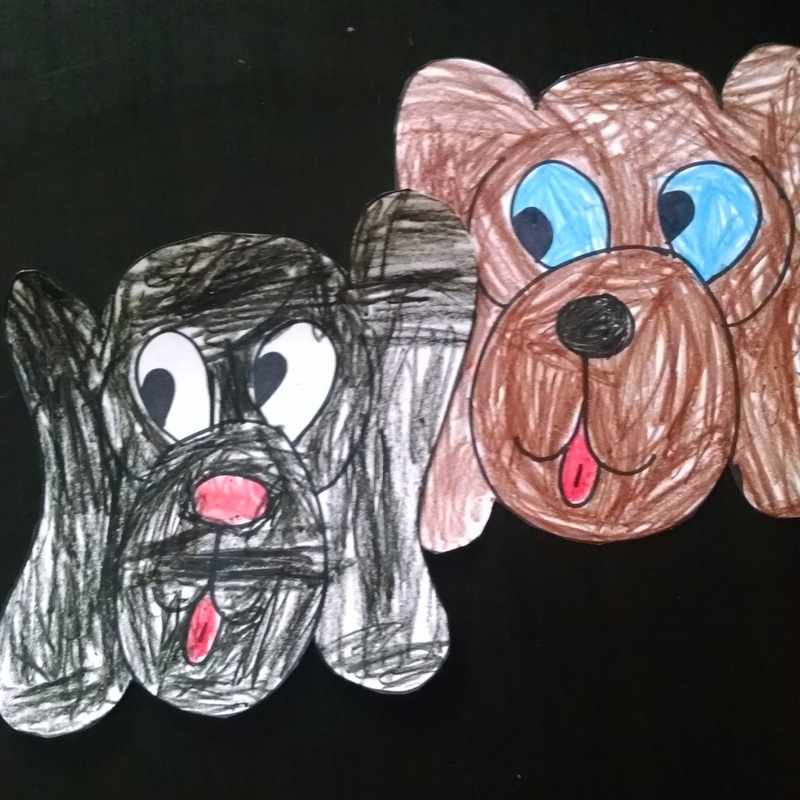 Drawn by me, colored by the kids. Another successful theme day, minus the large amount of stuffed animals I had to put through the wash after having them outside for an entire day. 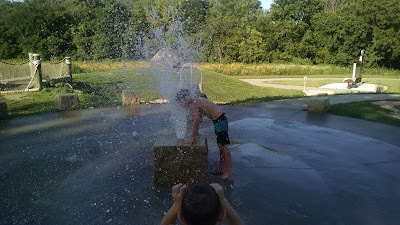 With temps in the 90's and heat indexes in the 100's, we've been looking for ways to beat the Iowa heat. 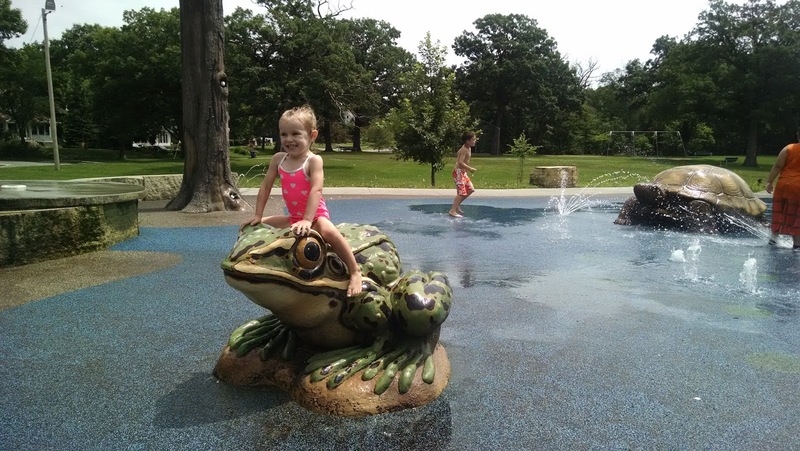 We've been extremely busy lately and haven't had time to enjoy our favorite splash pads, spray grounds, and pools around the metro. 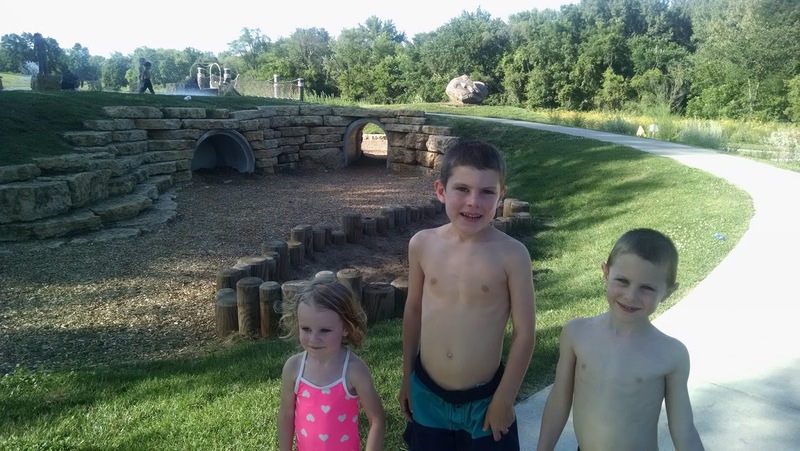 I decided our staycation was the perfect time to enjoy some of our fave Des Moines spots. 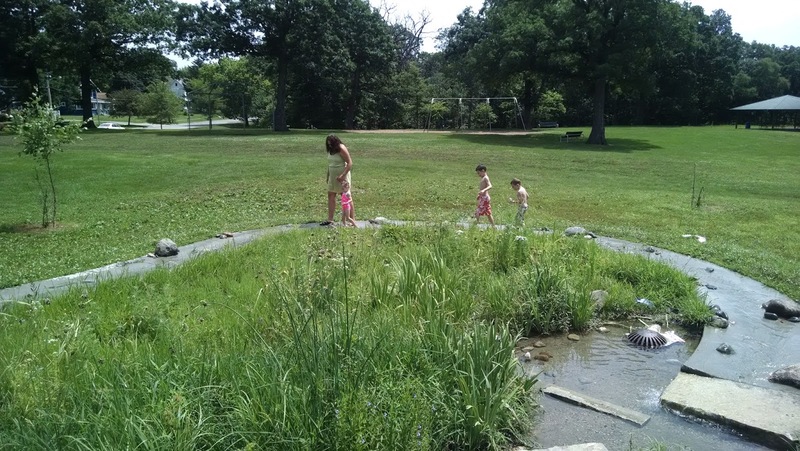 Enter Tour of Wading Pools. 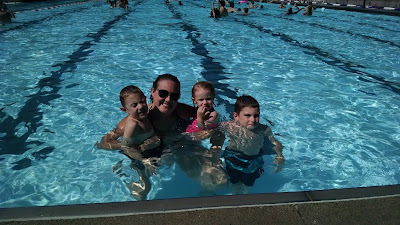 It was a whirlwind two days of running, splashing, dunking, crawl stroking, and driving from pool to pool. In other words, the perfect way to beat the hot and humid weather! 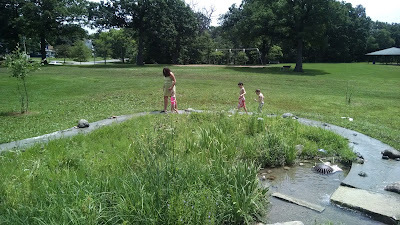 This is the kind of wading pool that I remember as a kid. 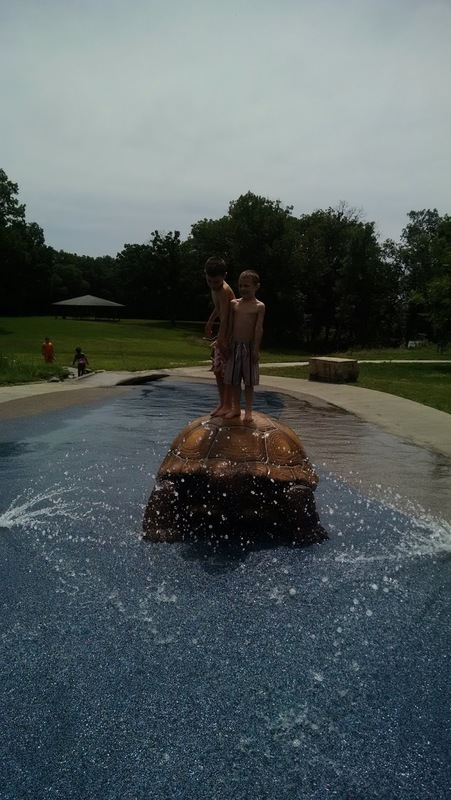 My kids had never seen a wading pool like this before (we're fans of Ashby Park's Splash Pool). 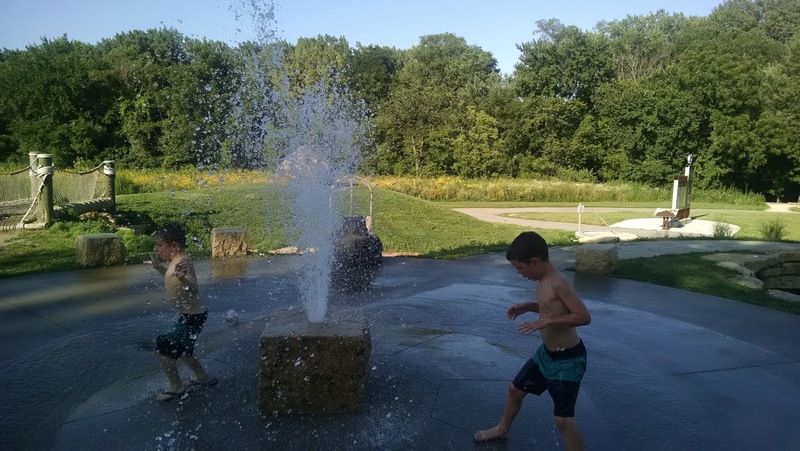 They were a little taken aback by all of the cement but quickly loved that it was a little deeper than the splash pads we've previously been to. It was large and not crowded at all. 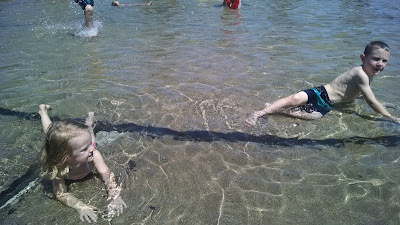 Even I floated in the water a bit while the kids splashed at me. 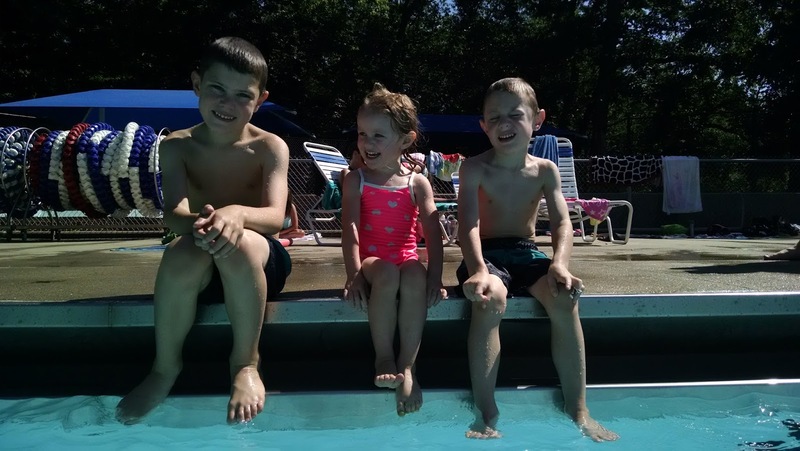 The only draw back to this wading pool is that it's only open Monday - Friday. 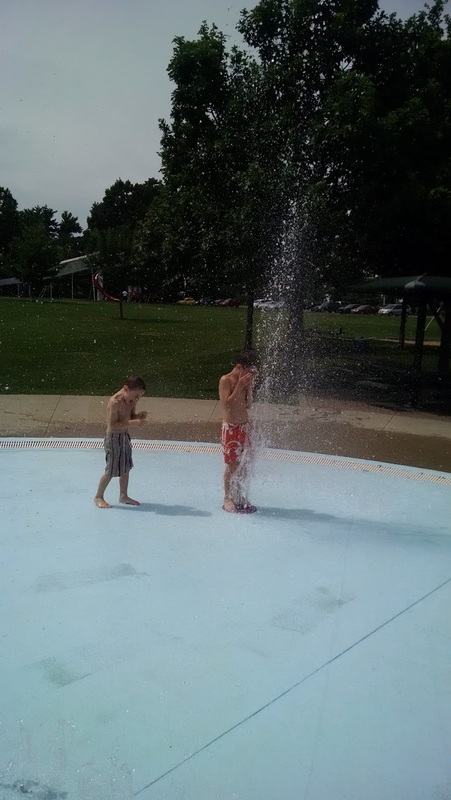 I really appreciate the splash pads with weekend hours as well. However, if you find yourself able to get out during the week days, Franklin Avenue Library is right down the street. It would be pretty perfect to enjoy a story time at the library before heading over to the pool. The kids can run around and parents can enjoy a new book from the library. Upon arriving at the park I was rather curious about the large blue pole in the middle of a cement slab, but the boys quickly figured out where to press the button. The water shot out and the boys had a blast running through this simple water fountain. 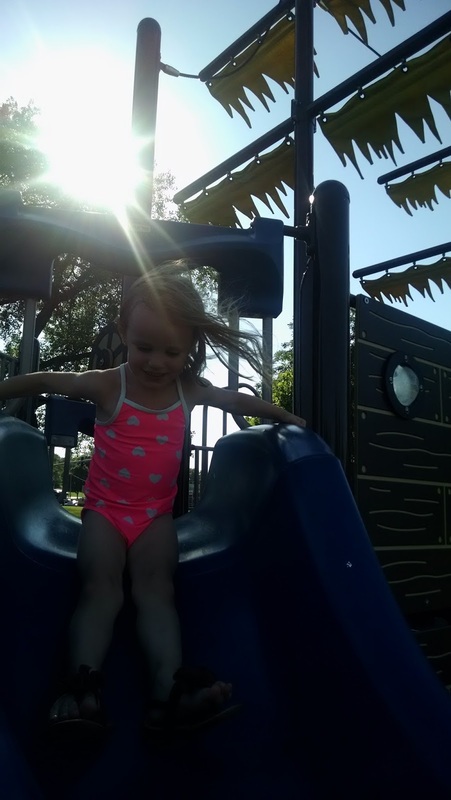 The best part about this park? 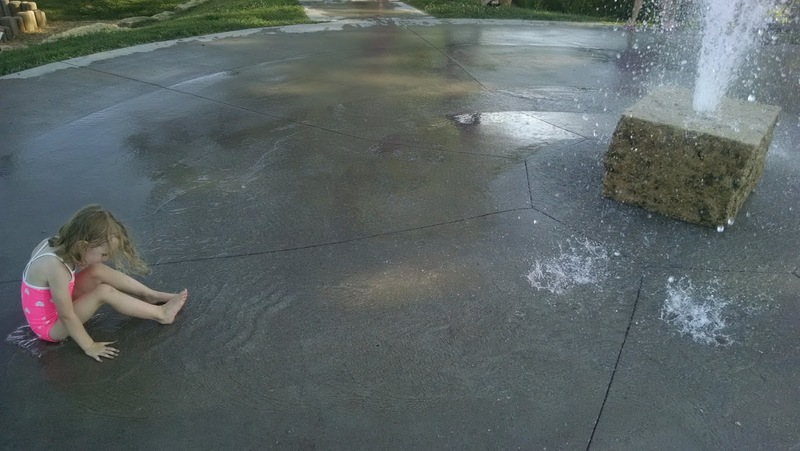 We had it completely to ourselves! 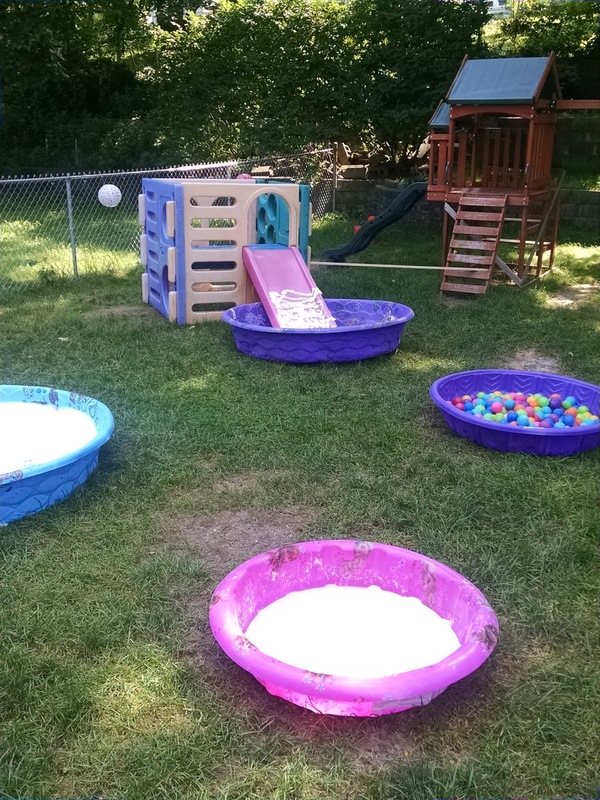 It may not be a pool, but it's just as fun, I promise. 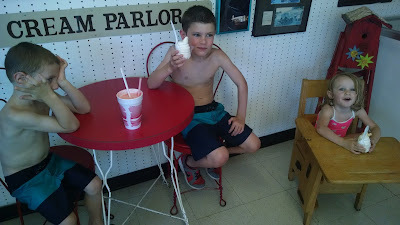 We took a break from our pool hopping for a cool treat. Harrison tried a root beer float for the very first time. I loved this little ice cream shop when I was a kid and I'm so happy that my kids share my love for it too! 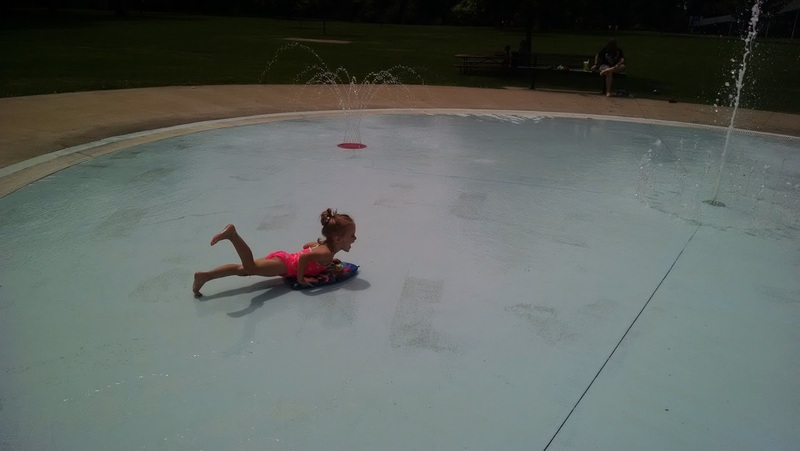 It's not a wading pool, but it's the minis favorite pool in Des Moines. Diving boards, actual deep ends, and a completely separate kiddie pool for the younger ones (or for the older ones when they decide they're done jumping off the side of the pool after a solid hour). It was pretty cheap too: $2 for kids, $4 for adults, kids 2 and under are free. This was the perfect pool to practice their newfound strokes from swimming lessons. 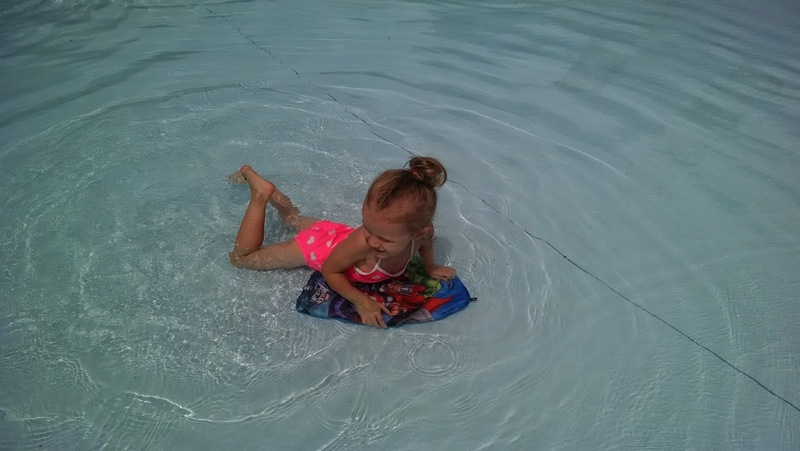 The best part about this pool: even when it's crowded, it doesn't seem crowded because this pool has a lot of room. We went to this playground on our Tour of Parks last fall and have been waiting run through the pirate ship spraygrounds. 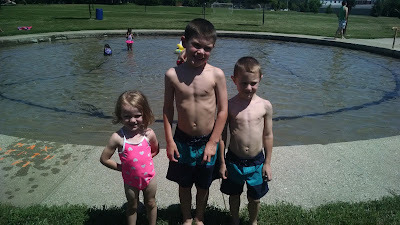 The boys loved it, but Elizabeth wasn't fond of it. The only thing I don't enjoy about this park is that it's always crowded. 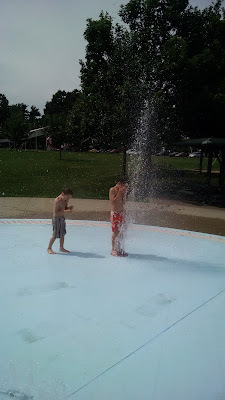 The kids thought the water was "too cold" so we went over to the playground for most of our time there. 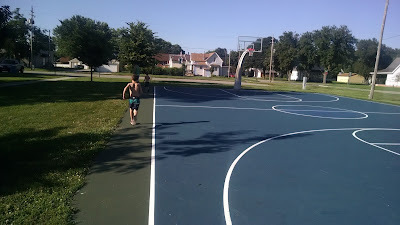 Max ran laps around the basketball court. 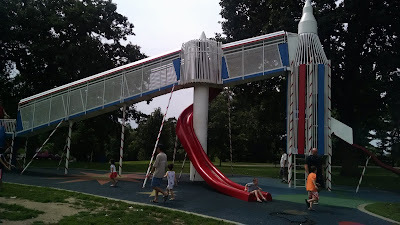 This was another park from our Tours of Parks that we loved and were excited to get back to. The fountain was simple, but there's so much to do at this all natural park that we spent an hour running around, through the tunnels, down the slide, and into the fountain to cool off. 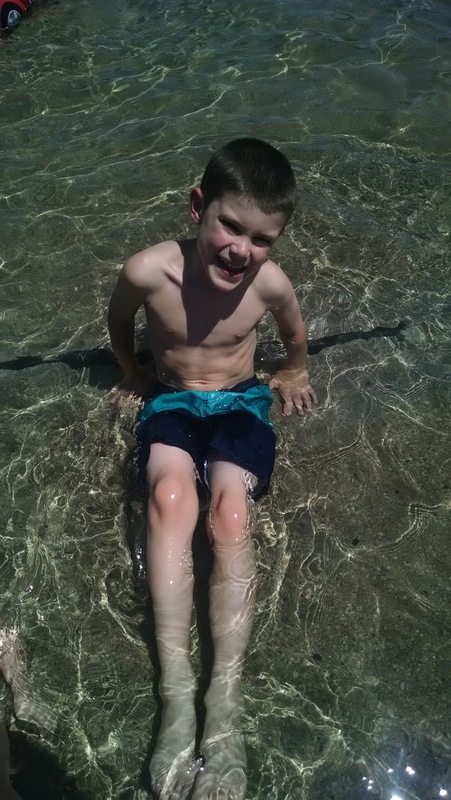 The fun only ended because Harrison got a bee sting on his cheek and demanded to go home. We may have been there for the splash pad, but it wouldn't be a visit to Union Park without a ride on the carousel and sliding down the rocket slide a few dozen times. 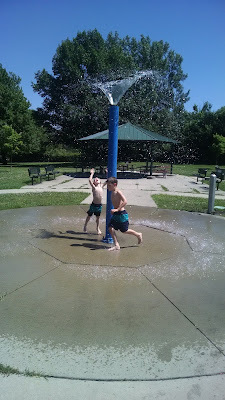 This splash pad is the same as Ashby Park's, but it was a lot less crowded. Union Park's splash pad also had a lot of covered picnic table near the pool. It would be a great picnic lunch spot! This is our favorite spray area in all of Des Moines. There's so much to do plus this park has an awesome climbing rock and beautiful views. We've been here a few times in the past, but this one was a must on our wading pool tour. We overlooked the fact that it wasn't a wading pool, spray ground (although the park does have spray grounds among the playground equipment) or a pool because we all love this beach. Even when it's crowded it's not crowded, there's always parking, and it keeps us all entertained for several hours. 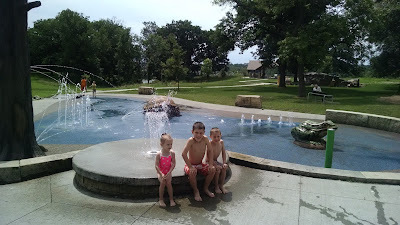 On our way home from the beach, we took a poll which swimming spot was our favorite. Our number one place was Raccoon River Park Beach, followed by Union Park splash pad, Ashworth Pool, and Sargent Park fountain minus the bee sting. 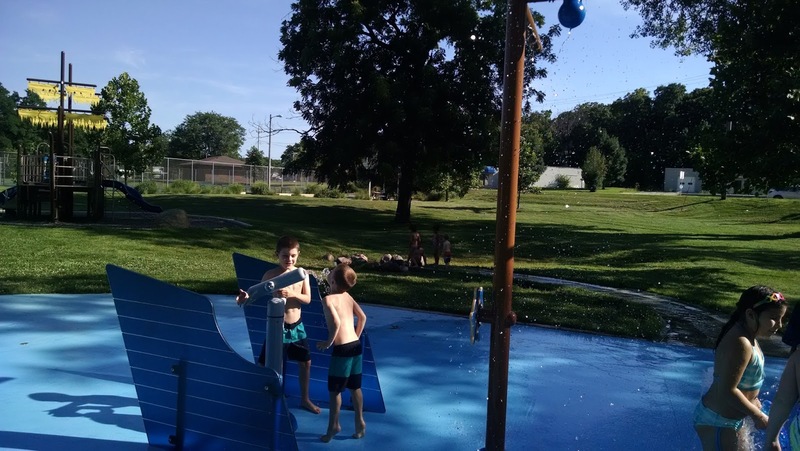 I was surprised one of the kids didn't put Tower Park wading pool at the top of the list because they really enjoyed that wading pool. However, it was the first one we went to so I think it may have been forgotten about. The next time you need something to do on a hot day, check out one of these fun pools (and don't forget to bring water to drink as well)!